“The I.R.S. Should Go After Trump” was a headline on an op-ed piece in the New York Times that jumped out at me the other day. In part I’m always interested in articles about the IRS, and it did impart some good information on their practices. It also reminded me of all the brouhaha around Trump not releasing his taxes and those who said they would not pay until he did so. 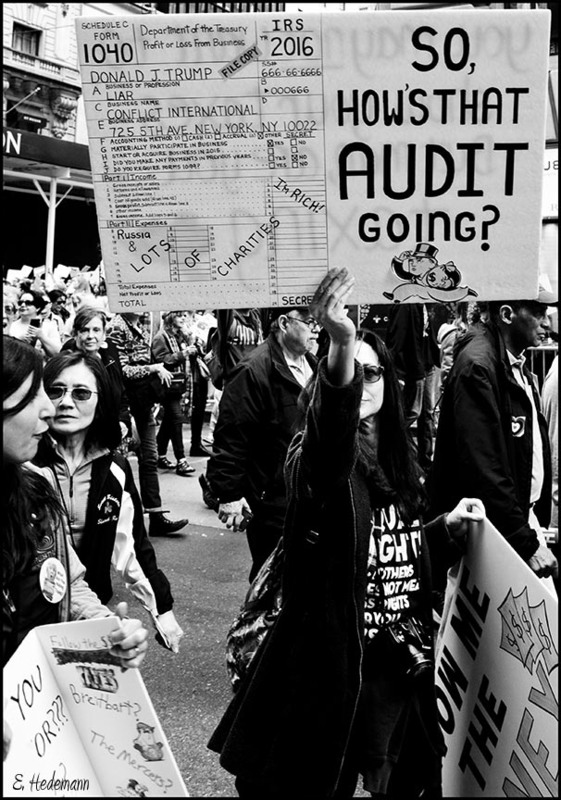 Tax March, tax day 2017, NYC. Photo by Ed Hedemann. The author, Phillip Hackney is a former lawyer for the chief counsel of the IRS, so he knows something about the inner workings of the agency. His piece was inspired by the New York State attorney general going after the nonprofit Trump Foundation for using a charitable organization for personal purposes (“self dealing”) and violating campaign finance laws among other things. The state has filed a lawsuit, but Hackney thinks there is plenty of evidence to file criminal charges against Trump and/or the Trump Foundation and his responsibility related to 990 tax forms he signed on behalf of the Foundation. There are fines and civil penalties — of which war tax resisters (WTRs) are quite aware — that can be enforced instead. With experiences during more than 70 years of the modern war tax resistance movement, we know that the government relies heavily on their power to intimidate and their power to levy and seize rather than take WTRs to court. 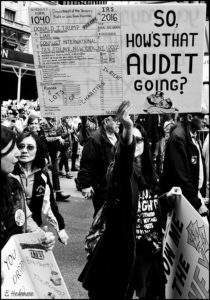 The fact that many of the most open resisters file their forms and announce their refusal to pay with letters and public statements makes it difficult for the IRS to charge us with evasion. It happens, but not much (see our Consequences page and the linked charge of resisters taken to court). The question of charges related to false statements is of interest also. In the 1970s the IRS did go after 15-20 WTRs for filing false or fraudulent W-4s, i.e., taking extra allowances to lower withholding and signing the perjury statement on the form. Now the IRS does a better job at matching W-2 forms and income filed on 1040s to determine if the W-4 is incorrect. Rather than bring criminal charges the IRS demands that the employer change the allowances on the W-4 to 1 or a number the employee can prove to the IRS is accurate based on tax law. Still, mostly I’m thinking about all those people during the campaign and on tax day 2017 who were threatening not to pay because of Trump’s tax-release evasion. Did people who said they would not pay actually follow through? Is there any way for us to tell? At this moment I probably owe the IRS a quarter of $1 million when you add on the interest and penalties on my unpaid taxes. I continue to expect the IRS to do something More than send me the usual letters and lien notices but so far that is as far as they have gone. That could of course all change tomorrow. And part of me really wants to do all change and for them to do something dramatic. Historically conscientious reisters make poor targets for the government. Even when the government seems to win those of us who are doing the right thing for the right reasons I’ve been win the public relations war. The conclusion of the as yet unreleased documentary The Pacifist is a challenge to the IRS. You know where I am at! Come and get me! Make my day! Nice piece! Yes, I do wonder about all those people who early last year said they’re not paying as long as Trump keeps his taxes hidden, assuming he must have cheated (however, it is possible his tax forms are legit, just embarrassing). Like the threat of impeachment, I’m not holding my breath whether the IRS will ever bring charges against Trump and, if they do, whether they’ll stick with meaningful consequences. But I do think it’s problematic for principled tax resisters to sic the IRS after political enemies, as many Democrats and other anti-Trump people have done. For snakes and others who have something to hide, exposure is more effective; and for us, IRS attention, as Ruth notes, does make it easier to organize. Though I’m not volunteering. Twitter is full of people this week saying “we should” stop paying taxes in protest against Trumpery. I set up a search and I keep one eye on the tweets as they parade past. Most of them are just blowing off steam or puffing up their chests in a context where they figure nobody will hold them to what they’re saying. But every once in a while I see someone who seems to be sincere. I had a good conversation yesterday with someone curious about the methods and possible consequences of neglecting to pay estimated taxes. She seemed ready to take the plunge. Social media can be a good foot-in-the-door for one-on-one outreach in this way. But you do have to fish patiently.